Product prices and availability are accurate as of 2019-04-16 15:13:34 EDT and are subject to change. Any price and availability information displayed on http://www.amazon.com/ at the time of purchase will apply to the purchase of this product. Get 900 high-quality business check refills to meet your printing needs. Checks Business Pack includes 3-Up business style paper with superior security features and compatibility with Quicken®, Quickbooks®, Microsoft® Money, all versions of Checksoft¿, MyCheck Writer, and VersaCheck® products. Save money and reduce your check costs by up to 80%. 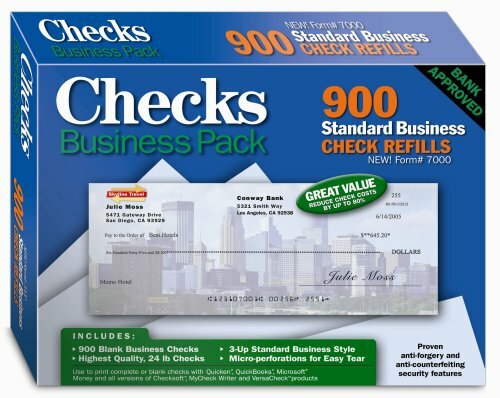 Checks Business Pack includes: 900 business checks; 3-Up standard business style; Form #7000; Blue and green color options; Highest quality, 24 lb checks; Micro-perforations for easy tear; Ability to print complete or blank checks with Quicken®, Quickbooks®, Microsoft Money and all versions of Checksoft, MyCheck Writer and VersaCheck® products; Anti-forgery features ¿ full solvent dye reaction and brownstain; Anti-counterfeiting features ¿ UV dull basesheet and invisible fibers; Great value - reduce check paper costs by up to 80%; Check paper that is bank approved in the US.